This past month has been a whirlwind of activity in the studio. As the self-appointed "event manager" for my sister's milestone birthday celebration, it was my job to pull together a party in a city more than 2200km away. A two day drive through rural/outback Australia with a vehicle filled to the rooftop with props, made for an interesting journey! 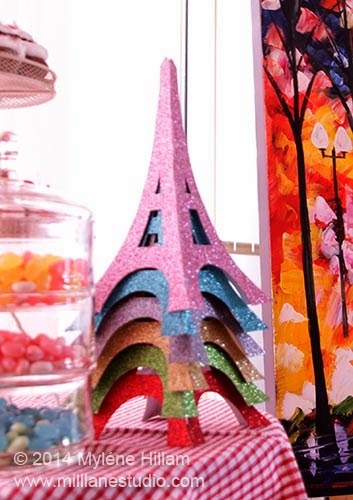 My sister has always dreamed of travelling to Paris - a gift my older sisters and I realised we couldn't make come true so we did the next best thing and brought Paris to her. We threw a Parisian Café/Pâtisserie themed party for her with all the trimmings we could. 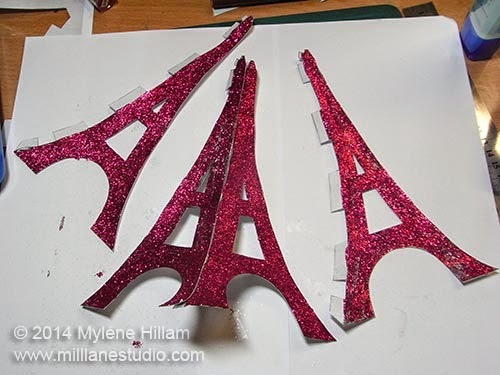 As the crafty sister, I volunteered to make the props so I've got quite a few tutorials and how-to's to share with you in upcoming posts and the first one is these glittery Eiffel Tower table decorations. I did a practice run of these before diving into the final ones and I'm glad I did because I saved myself hours of work. 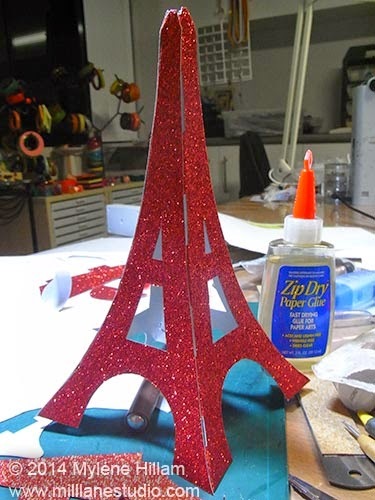 The prototype was made out of white cardstock which I liberally coated with adhesive and glitter. It worked, but it was messy.... and the liquid adhesive took several hours to dry. And then there was the "glitter flying everywhere" problem! When it came time to the final ones, I used Bella! Glitz sheets from @RubyRockIt which have perfect glitter coverage - no adhesive required. Such a time saver! 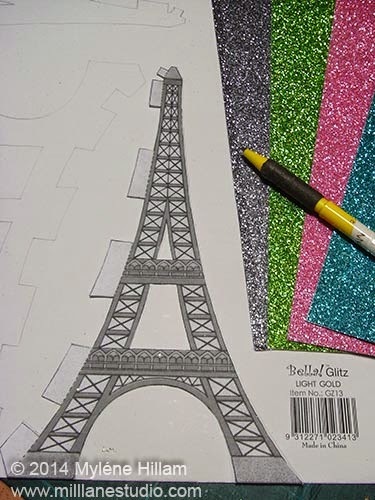 You can fit all four sides of the tower on one sheet so it is quite an economical decoration. The template I'm using can be found here and a big thanks goes to patricia m for making the template available. You actually only need to trace off one of the templates as it is the same on all four sides. I used both scissors and a scalpel to cut the towers out. After making one, I learned really quickly that using a scalpel is hard on the finger tips so use the scissors wherever you can. 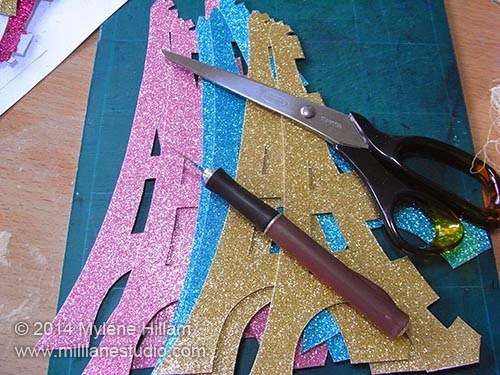 Cut the centres of the towers out with the scalpel and then use scissors to cut out the outer shape. Finish by trimming down the sides of the tabs with the scissors and then in between the tabs with the scalpel. You'll thank me for this tip after you've cut out 24 sides! Next, score the tabs and also the very tip of the tower so that it folds over when it's glued. You need a really strong adhesive on the tabs. I used Zip Dry because it grabs really quickly. The trick to getting these curved edges to meet on the folds is to line up the edges of two cut outs with the wrong sides together and then apply the adhesive to the bottom tab. Work your way up the side and hold the two pieces together until the adhesive has grabbed. You can use bulldog/fold over clips to help but don't leave them on too long or they will damage the cardstock. Once all four sides are glued together, they look like the one above and when you make them en-masse, they really absolutely fabulous. I have so many more wonderful props to share with you so I hope you'll keep checking back to see what else I made.